If you're looking for a fun, cheap Valentine's date idea, you may need to look no further than the gym! No matter how hard you work yourself out, exercising with a partner definitely yields better results than flying solo, for a few different reasons as follows. Adaptation: Even if it's unintentional, over time you'll begin to repeat the same exercises over and over. Maybe you think they're fun, maybe you're seeing gains, or maybe you're just on autopilot. It might not be a bad program, but over time, your body becomes adapts to the activity; in fact, that's the point of working out, placing your body under progressive stress and forcing it to adapt. Of course the key word here is progressive, and if you aren't changing it up, then you are no longer progressing. That's where the buddy system comes in- your buddy may have adapted to his or her workout as well, but odds are you aren't doing the exact same routine. So mix it up! Take the hardest elements from each of your repertoires and create a more effective workout. Motivation: There's nothing like having your own cheering section to make you push through the last few reps or run that last flight of stairs. When working out on your own, you may try to lift until failure, but when you're with a partner, you might find you can add on another rep or two. Think about it, when someone's cheering "you can do one more!" are you really going to stop and say "nah... Not today"? Safety: Safety in numbers definitely applies to any form of exercise, but when the exercise is inherently dangerous in any way, such as mountain biking, open water swimming, or even weightlifting, it becomes even more important. Even the fittest person can have an accident and, in the most extreme instances, having a buddy present can literally be the difference between life and death. When lifting weights overhead, such as a bench press or military press, most people actually lift more when they have a spotter. Having a spotter adds security which allows you to focus on performing the lift without worrying about potentially losing control of the weights and injuring yourself- just another added benefit of the buddy system! Adherence: Everyone has days where the couch is more alluring than the treadmill. A standing gym date with your workout partner curtails the habit of shirking your fitness duties. No one wants to be the 'flaky friend,' so odds are you'll keep your gym dates unless something really big interferes, meaning you'll be more likely to stick with it than if you were working alone. Competition: When working out with a partner everything can become a race or a contest- whether it’s swimming laps, counting push-ups, or seeing who can hold the longest plank. Even if you don't think of yourself as a competitive person, you'll probably be glancing to see which weights your buddy picks up before you choose yours... Maybe you'll even be going 5 pounds heavier, subconsciously of course. Fun: Having a partner or friend along can definitely make the gym feel more like a party than a chore. Laughing and chatting between sets is certainly more stimulating than changing songs on your iPod! In case you need another reason, here are just a few fun exercises you can try with a partner and a medium medicine ball. Stand back to back about a foot apart from your buddy. 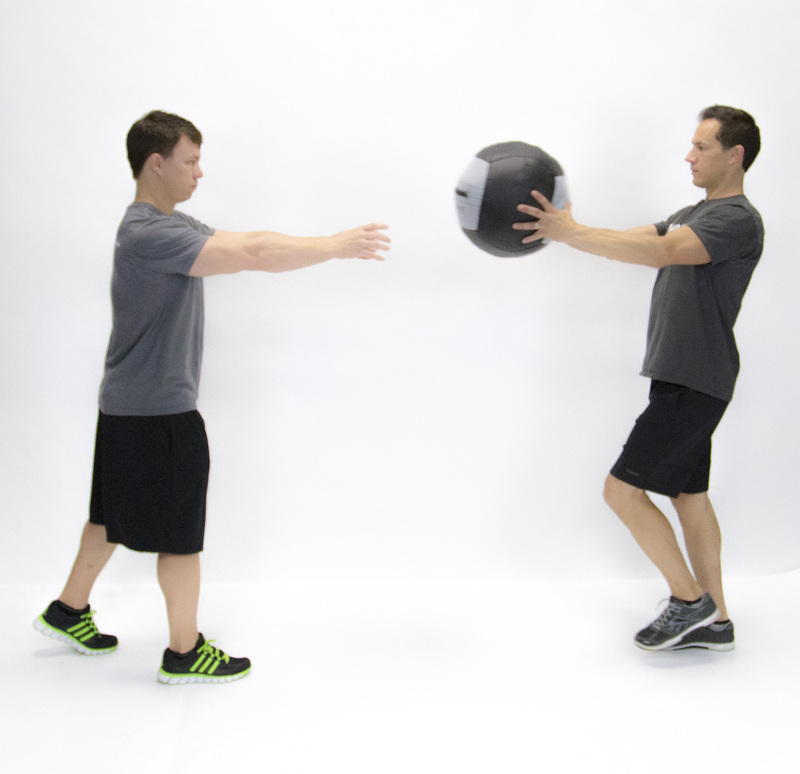 Hold the medicine ball with both hands and keep a neutral stance, with feet under hips. Start by squatting down and rolling the med ball between your legs to your partner. Your partner squats to pick up the ball, then passes it (carefully) overhead with a movement similar to a triceps extension, arms overhead, bent at the elbows. You reach back, in the same position, to reclaim the ball, and repeat. Perform this for 30 seconds then change directions. Make it harder by using a heavier ball and by omitting the roll, instead passing the ball directly to your partner between your legs. Stand facing one another in a neutral stance. Start by holding the ball at your midsection, then perform a lateral shuffle for 5 seconds or steps to the left and back to the right for one rep. Chest pass the ball to your partner and shuffle each direction again for another rep before they pass the ball back to you. Perform the exercise for 10 full reps. Make it harder by adding squats at the end of each shuffle. Sit side by side with your buddy, a few feet apart. Both of you lift your feet off the ground and lean back slightly. 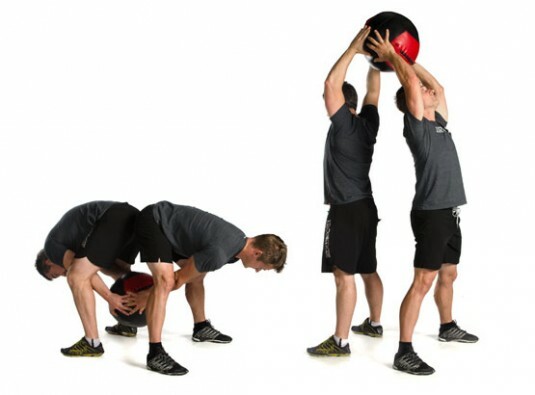 Keeping a strong core, twist towards your partner and toss them the medicine ball. Your partner then twists away from you, hits the med ball on the ground, twists towards you, and returns the ball. Twist away from your partner, hit the ball on the ground, and repeat. Shoot for 20 tosses before one of you has to get up and switch sides. Repeat on the opposite side to work the obliques evenly. Make it harder by sitting on balance pads or bosu balls and picking up the pace. When you work out with a partner, whether it's a Valentine's date or a buddy, you push yourself harder and have more fun. Try hitting the gym with a co-worker, partner, friend, or relative and you'll see some great results! Learn more about Sarah at her bio page and start your personal training today!